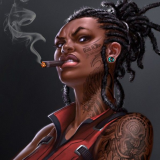 Do you enjoy running Shadowrun or at least want to try? Would you like to attend GenCon? Well, we can help you do both! The Catalyst Demo Team needs volunteers to help run the multitude of Shadowrun events we have scheduled for GenCon 2016. Without volunteers, we can't be successful! What do you get if you volunteer? Please go to the following link to volunteer! Once you've volunteered, the Lead RPGs Agent will contact you (not immediately, but within a timely manner) to take care of some minor paperwork (i.e. make you an official CDT Agent). If you have any questions, please direct them to me (Ray Rigel, rigel@catalystgamelabs.com) and the Lead RPGs Agent, Robert Volbrecht (srconvention@gmail.com). We're still looking for GMs to run Shadowrun at GenCon. If interested, please contact the two POCs directly to let us know you're interested. In addition, if you happen to run Battletech, Alpha Strike, or any of the other CGL games, we need volunteers to help run those at GenCon too. Please contact the same POCs directly if interested. Sent them an email. 32+ hour commitment good to go. We have a lot of people step up over the last couple of days ... THANKS! At this point I still need volunteers, but it is getting harder to fill in a 32 hour requirement. If your are willing to split your time between the RPG side as well as doing booth demos and/or working in the board game zone though we can still get you in there. Of course I can still use at least 4-6 volunteers at lower hour commitments as well!